The five alleles of the MC1R-gene are black (E), domino/grizzle (EG), sable (EH), melanistic mask (EM) and yellow/red (e). The yellow/red coat colour (e) is inherited in an autosomal-recessive trait. E, EG, EH and EM are dominant to e, therefore a dog has to possess two copies of e to be red or yellow. The DNA test includes the detection of carriers as well. 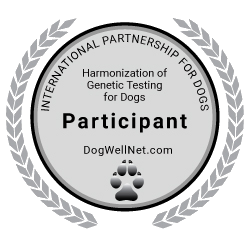 The test does not detect the domino/grizzle (EG), zobel (EH) or melanistic mask allele (EM).